The Morane Saulnier 221 C-1 is 593.2 KB. Larger files take longer to load. This is the Morane Saulnier 221 C-1 listing page, here you can download the plan, article and see the main thumbnail and extra images. The Morane Saulnier C221 was a unique French fighter aircraft produced to compete for the "Jockey" lightweight fighter program of the early 1930s, a program that has striking similarities to the USAF's 1970s 'Light Weight Fighter' program that pitted the General Dynamics YF-16 against the Norththrop Grumman YF-17 in a competitive development and flight test program. "Jockey" program entrants were incentivized to develop fighter concepts with good performance - high climb rates, long endurance - using lower power motors and lighter armament than more conventionally-designed aircraft of that era. While the Morane Saulnier C221 had excellent performance, propulsion shortcomings. became evident and full-scale production was never achieved. 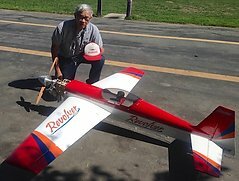 The model presented here, designed by Richard Rioux, spans 27" and is a rubber-powered sport scale free flight model best flown indoors, or outdoors in calm air. The model faithfully replicates the parasol-monted main wing, slightly swept back with very small dihedral (2 degrees). The fuselage requires special care for assembly as fuselage formers are 'suspended' by lightweight stringers without any lengthwise longerons; a jig is highly recommended to control and maintain fuselage alignment during construction. Thanks to 'nibor' for bringing back this most unique example of a 1930s era 'lightweight fighter'! These are the details for the "Morane Saulnier 221 C-1" plan. If you would like to become a plan editor and help us to edit the attributes of all the plans in the website please click the "Edit Attributes" button below. Order your Morane Saulnier 221 C-1 prints today! 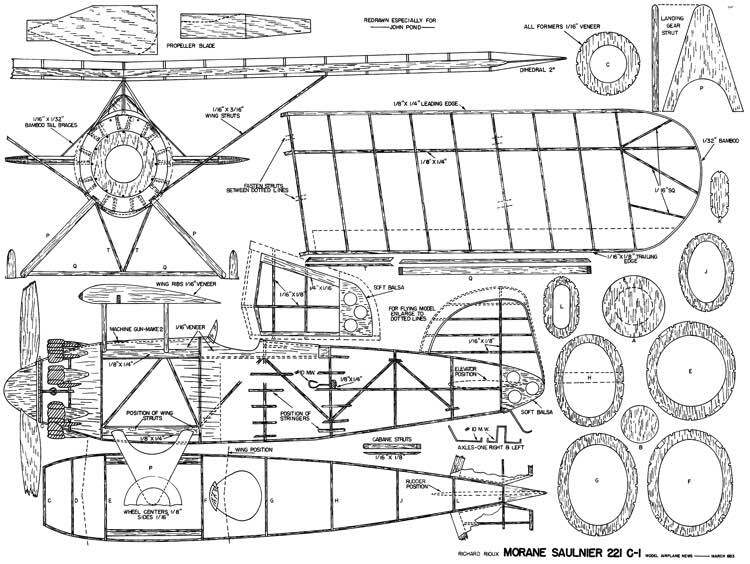 The Morane Saulnier 221 C-1 plan can be printed on plain paper, tracing paper or polyester film and shipped worldwide. This tool allows you to calculate the cost of printing and shipping the Morane Saulnier 221 C-1 plans and its building article if available. If you need to resize a plan please contact us with the ID:82837 and the desired wingspan. I will calculate a price upon request, please contact me here mentioning this PlanID: 82837 and the job you wish me to do. This plan is 593.2 KB and was shared by our member aeroastro on 01/04/2015 00:38 in the PDF Bitmap Wood Model Airplane Plans (1) category.